and the name of the virgin was Mary." --Luke 1. Athwart the somber season of Lent, the deepening shadows of which grow darker still until the bright dawn of the resurrection morn dispels their gloom, there flashes the glory of a divine fact which gives to this festival of the Annunciation of the Blessed Virgin Mary a rank equal to that of the greatest feast of the Church. This divine fact may well inspire our hearts with the most tender, the most exquisite, the most joyful, affections of thanksgiving, for to its existence we are indebted for the inestimable grace of Redemption. It was upon this day, beloved in Christ, that the angel Gabriel--to whom God had given in charge the precious soul of her whom He had from all eternity chosen to be the Mother of the Word Incarnate--bore to the tender Virgin, whose purity had never been tarnished by the slighest breath of evil, the joyful tidings that she was, while preserving the pearl of virginity, to become the Mother of God. It was upon this day, then, that the Son of God assumed our human nature for the redemption and salvation of fallen man; and yet there is, in general, but too little attention devoted to the consideration of the mystery we commemorate thereon; for, by the greater number of Christians, it is regarded and celebrated simply as a feast in honor of Mary. But, in fact, it is the very corner-stone upon which rest all the other feasts,--commemorating, as it does, an event which cannot fail to fill the human heart with adoration, gratitude, and the most intense consolation. Every thing depended upon the decree of God whether, in His infinite mercy, He would be pleased to stretch forth His arm and rescue the human race from the abyss of a wretchedness too profound almost to be conceived. 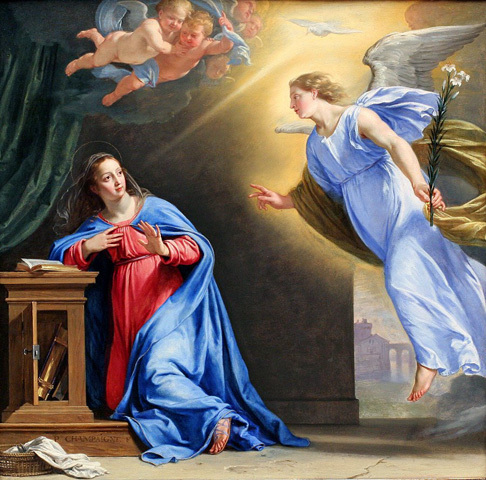 But, since "the angel of the Lord declared unto Mary" the message of salvation, and the Son of God assumed on that very day her flesh, everything was changed; and from the Feast of the Annunciation came forth Christmas, Easter, Pentecost, and the eternal triumph of the Church. Let us consider today the message of the angel to Mary in its divine sublimity, as well as in the importance with which it is invested for the children of men. O Mary, who was already full of grace when the angel saluted thee, and elected thee not only to become the Mother of God, but also Mother of all the children of God, accept us today as thy children! I speak in the most holy name of Jesus, for the greater honor and glory of God! If, my beloved Christians, the words of the holy gospels--whenever we open the pages of the inspired volume, but especially when we hear them from the lips of the priest on the occasion of the celebration of the feasts of the Church--tend ever to inspire us with joy, and to elevate our hearts to God, this is especially true of the gospel which is set apart for this joyous day. "At that time the angel Gabriel was sent to a town named Nazareth, to a Virgin called Mary." Blessed words! for, as often as we hear them, the happy event which we commemorate today arises immediately before our eyes, clear and distinct, as if we had been present when the glory of the angel irradiated the humble little room at Nazareth. In spirit, we behold the Immaculate Virgin, united with her God in fervent prayer, oblivious of all but Him, when, lo! an angel of the Lord appeared before her. We can almost hear his voice, in the tones of which still linger the sweetness of that celestial music to which it were bliss to list. We have every reason to learn and to ponder deeply upon the signification of this angelic message, which was a most holy, a most solemn, a most momentous, a most consoling, and joyful message, both for the Blessed Virgin and for her devoted children. In every message the importance is increased or lessened according to the dignity of the sender. A message is brought to us by a relative, acquaintance, or inferior, and produces but little effect upon us; we may not even delay the messenger long enough to hear what he has to say. But suppose a person of high rank has something to say to us,--a Prince, a King, an Emperor, the President, the Pope! With what consideration we treat the messenger! How very attentively we listen, that we may know precisely what he has to impart! Imagine, then, how important, and, at the same time, how holy, was the message of the angel! It came from the Most Holy Trinity--God the Father, Son, and Holy Ghost! It was the message of the Infinite Majesty, the most merciful sanctity of God to Mary, and, through her, to the entire human race! It was a most solemn message. What invests a message with significance, is the form and manner in which it is transmitted. Here we behold an archangel--one of the seven princes of heaven--declaring the will of the Most High; and who can conceive what myriads of angels attended Gabriel when he presented himself before Mary, Queen of angels! Who can picture the profound respect with which he saluted her, in whom he already beheld the Mother of the Son of God made man! With what deep veneration he addressed her, the chosen one of all the daughters of Eve,--destined from all eternity to be exalted as mistress above the whole celestial choir! It was a most momentous message, for the subject of a message is what constitutes its importance. It made known to the world, to the human race, that the possessions lost through Adam would be restored; it heralded a great victory gained over the enemy of souls; it announced that the foe, from whom death and destruction would surely come, was shorn of his terrible strength. Let us suppose that, being under sentence of death, we had been granted a reprieve, or rather that the sentence had been entirely revoked, and that we had come into the possession of a great fortune, by which our happiness is forever secured: would we not consider the message which brought us the news glad tidings of great joy? Apply not one but all of these circumstances to the message conveyed to Mary by the angel, and we shall realize in some degree its stupendous character. Adam listened to the voice of the seducer, and his fall deprived his hapless posterity of their promised happiness,--that of being one day permitted to behold God face to face, in the possession and enjoyment of His beatitude and all the exquisite joys of heaven. All this was lost. However, amid the gloom which, for four thousand years, hung over a world groveling in darkness and in sin, there glimmered one ray of light in the promise of a coming Redeemer; but the time set apart for the expected and desired event was yet unknown. Then, when the fullness of time was accomplished, Gabriel appeared and announced unto Mary that she had been appointed or chosen to become the Mother of the Messiah,--of that child whose birth was heralded to the watching shepherds by strains of angelic music, as the celestial choir adored the Infant God. Humanly speaking, mankind had indeed reason to be alarmed; for, although the promise of a Redeemer had already been made in paradise to our first parents, yet the wickedness which prevailed over the whole earth was so terrible, that man might well tremble lest the Lord should declare it to be forfeited entirely. He might well apprehend that it was a conditional promise; the more so since four thousand years had already rolled down the stream of time, and the Redeemer did not appear, while man, through his own fault, sank deeper and deeper into the abyss of sin! The word of the angel to Mary relieved the faithful few from this harrowing anxiety. "The Saviour cometh!" We are rescued from sin and hell! From this day the heart of the Redeemer will throb beneath the loving heart of the Virgin Mother, who will present His first petition for the salvation of mankind to the eternal Father. Joyful message, which brought such happy tidings to us! To regain, through Christ, the precious gift of heavenly grace; to become again, through Him, children of God; to behold the gates of heaven open for us, and to have it in our power to enjoy the delights of that celestial paradise for an eternity which will never, never end,--Mary for our Mother, and the Lord for our portion forever! It is true that our individual sins had opened still wider the infernal gates, and made deeper far the yawning pit of hell; but, through the merits of Christ, the hope of a blessed pardon was held out to all "men of good will." The terrestrial paradise was lost, it is true; but in its place the kingdom of God on earth--the Church-- would henceforth become for man a garden of delights. The sorrow, the pain, the anguish of earthly trouble must still encompass us, no longer, however, as punishments for sin, but to serve as occasions of merit for the increase of our eternal joy and happiness. The concupiscence of the flesh, indeed, should still remain a constant cause of warfare; but, as a compensation, the measure of grace would be so multiplied as to enable the Christian to valiantly combat and bear away the victor's crown, and exalt his glory in heaven.The penalty of death had been pronounced upon man; but, through that dread decree, he can attain to the possession of a glory and delight which would never have been his had not Adam sinned in paradise. In a word, infinitely more was conferred upon man through Christ, the Son of Mary, the heavenly Adam, than he lost through Adam, our first parent. We not only became again children of God, and gained once more the right to call Him Father; but we were permitted to call His Incarnate Son our Brother. For, since the Son of God assumed our flesh and blood from Mary, He is, therefore, true Man, even as from all eternity, in His own divine Person, He was and is God. Oh, what an important, what a welcome and consoling message! All that can bring to the human heart the sweetest joy and solace is comprised in this message of the angel to Mary, as we will see if we take to heart all that has been said,--not merely hearing and believing it with a dead or dying faith, but also considering, and applying it to ourselves. In this, unfortunately, we are often wanting. Too many Christians are prone to celebrate the mysteries commemorated by the festivals of the Church only in their general relation, and not by reflecting what influence those articles of faith and divine truths should individually effect for us. Yes, beloved in Christ, be ye who ye may, the message of salvation directed by Gabriel to Mary bears an individual relation to every one of you, even as if there had been but the one soul on earth for whose salvation the Saviour came. You were sunk deep in the abyss of woe, not only through the disobedience of Adam, but through innumerable personal sins, which threatened you with destruction for time and eternity. But the Saviour was conceived in the chaste womb of the Virgin Mary, and the lovely dawn of a blessed hope brightened the darkened world. This hope has a more secure foundation for you, since, without any merit of your own, you have been called to be members of the true Church. Try, therefore, before you leave this holy place, to excite in your hearts all those affections which animated the heart of Mary on receiving the message of the angel. First, adore and thank God for having created you to His own image and likeness, and for having spared you when you were yet in a state of sin; but, above all, for having sent His only-begotten Son to redeem and save you. Renew your resolution to live as true children of God, as if Christ had been received into your hearts also as the pledge of a better life. 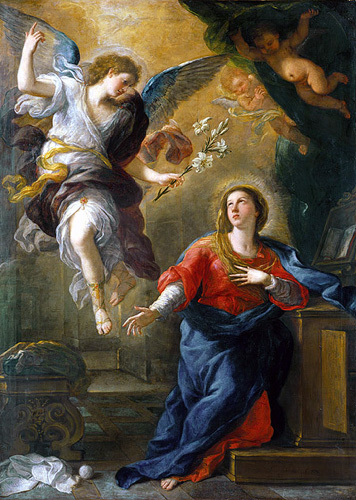 Thus you will become strong; and, although you may not have the happiness enjoyed by the Immaculate Virgin and Mother--of walking by the side of the Incarnate Son of God--you may, while living as her faithful children, enter one day into the communication of her glory and beatitude as children of God, also rescued through the incarnation of His eternal Son.--Amen!